Create your future with qualifications and skills! 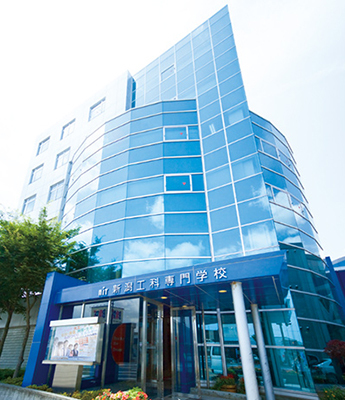 Niigata Institute of Technology is a technical college where students can acquire a variety of creation/manufacture/fabrication techniques and qualifications. Since it is a college accredited by the nation under the Educational Accreditation System, students have the advantage in obtaining difficult national qualifications. The institute focuses on practical training where students actually create architectural structures, such as designing of actual stores (interior and exterior), designing and construction of ecohouses, and the renovation of old folk houses, to ensure that students acquire industry-ready expertise. Class supervisors and persons in charge of employment give thorough job guidance to each student, which includes how to write a resume, interview training, preparations for tests, mindset toward job hunting activities, and communication ability. Students aim to obtain a second-class architect license in the shortest time possible. Students learn the basics and application of expertise and skills required of architects. Students aim to become construction industry-ready designers by acquiring broad knowledge and planning skills centering on design and CAD design. Students gain extensive interior and architectural knowledge and develop professional skills to create a beautiful and comfortable living environment. Students aim to become competent carpenters by acquiring traditional skills, the latest techniques, and architectural knowledge in the course. Students acquire knowledge and skills related to water, air conditioning, and equipment indispensable for living, learn how to draw technical drawings via CAD, and aim to become industry-ready engineers. Students can obtain national qualifications at the time of graduation from the institute. The course offers extensive training programs through which students acquire required skills to become specialists in the survey and civil engineering industry. Students aim to acquire a variety of national qualifications and electrical skills and become electrical and telecommunication specialists who support people's lives. Students aim to become manufacturing specialists by acquiring 2D and 3D CAD skills and knowledge and skills to design, manufacture, and assemble industrial products. Students learn marketing and promotion methods in addition to design and processing techniques and aim to become engineers who are capable of managing product development. Students learn methods to generate power via natural energy and device mechanisms and technologies and aim to become professional providers of environmentally-friendly energy that meets the needs of the times.